I'm surprised that this hotel is in the 5-star category. Yes, it's been renovated but other than that, the rooms and the bathrooms are small and the balcony window is still old and you can hear all the noises from outside. The additional room fee says it includes unlimited free coffee and tea (there is a small Keurig coffee machine in the room), but that is the norm in any hotel today, even a 2-star. At check-out, we were told that we had a credit of $55 and it was applied to our parking. We did have a car, and when I mentioned that and that we were never told that we had a credit that we can use for any of the amenities including food and drinks, she said that we can still use it in the next hour. I didn't have time to stay and eat or drink so I told her to apply it towards our charge since we were not told about it at check-in. After telling us it's impossible at first, she said she did apply it and printed out a different final receipt. When I look at it in more detail now, I see she only applied a smaller amount, not $55. This hotel charges amenities fee based on what they assumed would be liked by most guests which includes very generic coffee in the room which is freely available in most hotels especially a 5 star rated one. I could never get hold of the front desk even to ask a simple question and ended up having to personally message the manager on duty. Purchased a full ocean view room only to find out during the check in that all of their rooms are partial ocean view rooms which is very deceiving. Would never stay here again. Excellent location as you can see the ocean from the building, 1 block away from toes in the sand / swimming in ocean. the lanai provides wonderful views of the ocean even if it's a "partial view". it is nice to be off the main strip where everyone roams for shopping. also makes it easily accessible for uber/taxi and tour groups coming to pick you up. within walking distance of anything and everything you need. ABC store on every corner, and 1 inside the actual hotel. the rooms are spacious. good water heat and pressure. I like that you do not have to get towel cards every day and they trust you to take and return at your leisure. they also have umbrellas for borrow during rain storms. wonderful decor and rooftop pool/hot tub. all in all a wonderful stay. highly recommend. Small issue with check in, but management fixed it immediately. Breakfast bar, pool side bar, and view was amazing! Thank you so much! Lovely property. Rooms not big but newly redone with modern minimalist decor. Very nice. Comfortable bed. Had speedy and polite checkin which was much appreciated after a long day of travel. Reserved a room with ocean view and view of Diamond Head. Got a front corner room with spectacular views. Dined outside at Momosan by Morimoto. All food was delicious and served quickly. Wish we had the time to dine there again. Hotel is in a great location right across from Waikiki Beach and lots of shopping. Highly recommend and would stay at Alohilani again. The property is advertised as VIP so you would assume premium hotel in preying location. I booked the “ocean view” expecting an ocean view through the window. I checkin and I’m facing a budget hotel. The ocean is to my left only when I step outside to the balcony. I would not categorize as ocean view, not even partial ocean as you cannot see any view of the ocean from your room. The pool area also was not as “luxurious” as advertised in photos. Clearly the location of amenities were not a good use of space. Recently refurbished property and they did a great job! Classy, modern, spacious lobby is a great first impression, 2 story aquarium in lobby bar. Elevated 5th-floor sun deck with infinity salt water pool with an excellent view of Waikiki sufing and sunsets is amazing. Jacuzzi is usually packed though, and there is a separate Keiki pool but many parents let kids run around pool and jacuzii, but not too much of a distraction. Very international crowd, staff is very personable, elevators are very fast, no trouble finding a spot in the attached parking garage. Great japanese restaraunt in property, as well as backdoor to ABC Store. They do not yet have any room service offering, but this is ok, your in Waikiki, plenty of other options within a few blocks. Took a chance on this as we usually roll Marriott, but it was a great experience and good quality for price and 'partial' ocean view. Very loud, noisy due to construction. No restaurants in the hotel. Excellent staff!! Thank Eddie the Lead Bell-boy for helping me load and bring my bags from the garage into our rooms. It was disappointing to find out that the “ocean view” room was an actually “partial ocean view”.... It is near the beach, just across the street but it can’t be considered a 5 star hotel. Also the swimming pool area is very small and no sun after 2:30pm. Great location and staff, close to the beach with great amenities. Located in Waikiki, 'Alohilani Resort Waikiki Beach is adjacent to Kuhio Beach Park and within a 10-minute walk of other popular attractions like International Market Place. This 839-room, 5-star resort welcomes business and leisure travelers with 2 outdoor pools, a full-service spa, and 2 restaurants. Enjoy dining at Lychee Restaurant, one of 2 onsite restaurants. At the end of the day, the bar/lounge is a great place to grab a drink. For your convenience, a buffet breakfast is served for a fee on weekdays from 6 AM to 10 AM and on weekends from 6 AM to 10:30 AM. Guests can expect to find free WiFi and 50-inch a flat-screen TV with cable channels. The bathroom offers hair dryers and designer toiletries. Other standard amenities include a furnished balcony, a refrigerator, and a coffee maker. 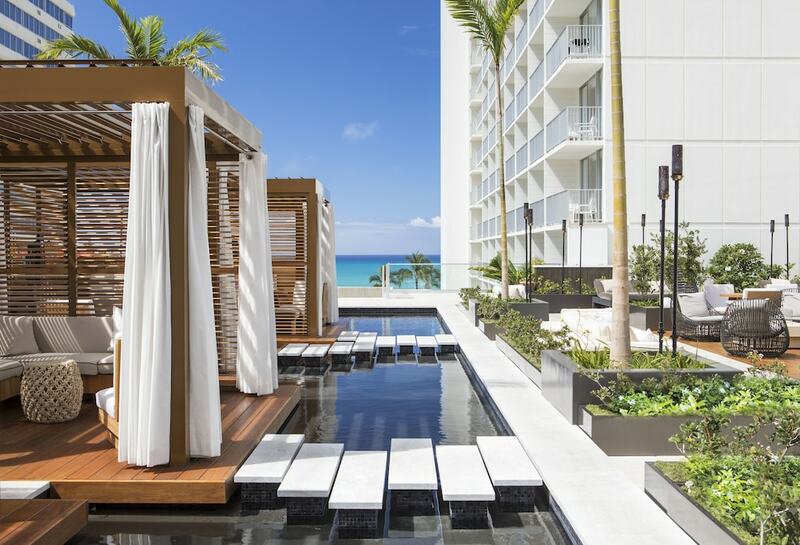 Guests of 'Alohilani Resort Waikiki Beach have access to a full-service spa, 2 outdoor pools, and a children's pool. Valet parking is available for USD 42 per day. Multilingual staff at the front desk are standing by 24/7 to help with tours or tickets, securing valuables, and dry cleaning/laundry. Other amenities at this beach resort include a fitness center, a rooftop terrace, and free WiFi in public areas. Buffet breakfast is served on weekdays from 6 AM to 10 AM and on weekends from 6 AM to 10:30 AM for a fee. Lychee Restaurant - Restaurant open daily for breakfast. O Bar - Restaurant and bar open daily for brunch, breakfast, lunch, and dinner. Kid's meals available. Swell Bar - Pool-view bar open daily for lunch and dinner. The resort has 2 outdoor swimming pools and a children's pool. Other recreation options include a fitness center. Pool access available from 8 AM to 5:30 PM. Book a stay in any room or rate category and receive access to Island Club and Spa's fitness facilities including complimentary fitness classes (spa services at an additional charge), USD spa credit per room, per stay (redeemable for massage, couples massage, and facials), Hawaiian cultural classes, aquafit classes, swell pool deck amenities and treats, eco-friendly water bottle, Keurig coffeemakers in-room with Alahilani's custom special blend coffee/tea, surfboard storage, children under 5 years old eat free at the breakfast buffet (children 5-10 years old receive half price), Keiki check-in experience with welcome gift, educational Tank Talks, live entertainment, portable phone chargers for use (subject to availability), USD 50 discount card at Trina Turk located in the International Market Place, and self-parking for the first night of stay will be upgraded to valet service. Full details provided at check-in. Added benefits are included in the mandatory resort fee collected at the hotel. Taxes and gratuity may not be included. Spa appointment may be required. No refunds for any unused portion of offer. Offer subject to availability. Offer is not valid with groups/conventions and may not be combined with other promotional offers. Other restrictions and blackout dates may apply.